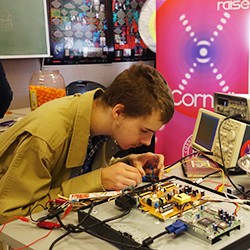 Now into the fourth year of its JunkGenies programming, Xraise is paving the way when it comes to infusing engineering design practices into science outreach. 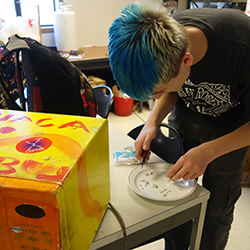 Early pioneers in the now-popular "Maker Movement", we are familiar with the positive impact that this type of project based learning can have on both attitudes toward science, and self efficacy in science. 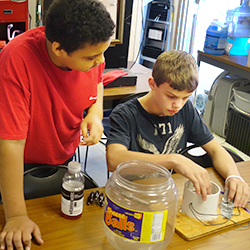 For the past two months, high school and middle school students from Ithaca's Lehman Alternative Community School have been coming to our dedicated outreach space, the eXploration station, once a week as part of their academic day. 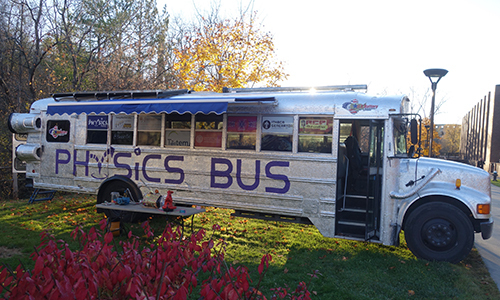 An elective class, their project is to design and construct physics exhibits for public display aboard the Physics Bus, a local science exhibition on wheels. In past weeks, a common desktop LCD screen has been transforming into the light box for a ripple tank, a hair blow dryer with no more heating element has become the life-force behind a tabletop "sky dancer", and an empty container of Cheese Balls is now a vessel for observing liquid vortices caused by a spinning magnet. The JunkGenies program affords students the opportunity to dive deeply into a concept while remaining motivated by the promise of having the product of their effort be showcased before thousands of people. Scaffolding is key in this type of rapid-prototyping learning environment. The diverse mix of projects, at various stages of completion, requiring such a wide variety of skills, demands "just-in-time teaching" from adults. 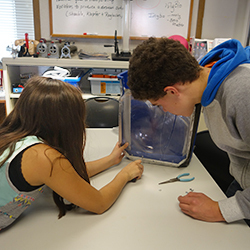 For that, the kids are grateful to have, in addition to outreach staff, the help of Cornell science graduate student mentors Howie Joress, Leanna Pancoast, Alfred Simkin, and Claire Fox. We are pleased that our initial pilot has evolved into such an icon for science in our community and we are excited to offer it as a model for other institutions.